Two, populists are not just anti-pluralism, but they’re also anti-elite. 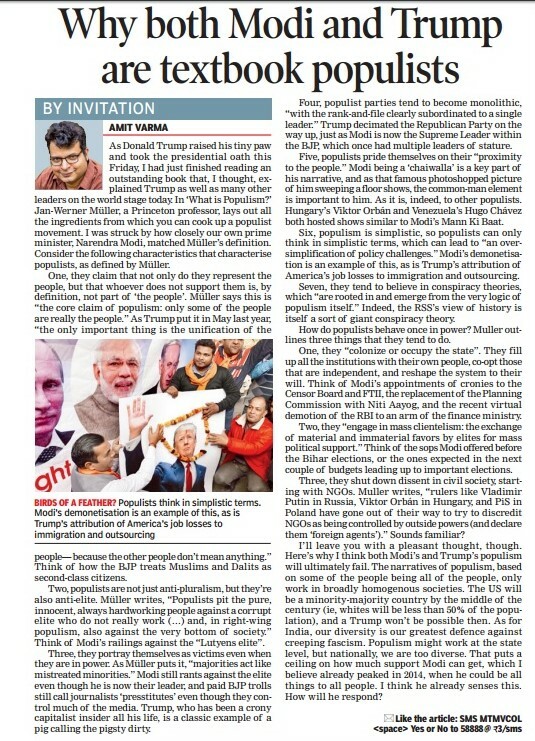 Müller writes, “Populists pit the pure, innocent, always hardworking people against a corrupt elite who do not really work (…) and, in right-wing populism, also against the very bottom of society.” Think of Modi’s railings against the “Lutyens elite” as an example. Three, they portray themselves as victims even when they are in power. As Müller puts it, “majorities act like mistreated minorities.” Modi still rants against the elite even though he is now their leader, and paid BPJ trolls still call journalists ‘presstitutes’ even though they control much of the media. Trump, who has been a crony capitalist insider all his life, is a classic example of a pig calling the pigsty dirty. Six, populism is simplistic, so populists can only think in simplistic terms, which leads to “an oversimplification of policy challenges.” Modi’s Demonetisation is an example of this, as is Trump’s attribution of America’s job losses to immigration and outsourcing. Seven, they populists tend to believe in conspiracy theories, which “are rooted in and emerge from the very logic of populism itself.” Indeed, the RSS’s view of history is itself a sort of giant conspiracy theory. How do populists behave once in power? Müller outlines three things that they tend to do. One, they “colonize or occupy the state”. They fill up all the institutions with their own people, co-opt those that are independent, and reshape the system to their will. Think of Modi’s appointment of incompetent cronies to the Censor Board and FTII, the replacement of the Planning Commission with Niti Aayog, and the recent virtual demotion of the RBI to an arm of the finance ministry. 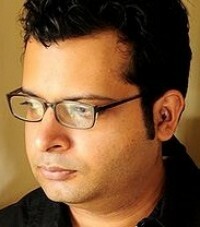 Three, they shut down dissent in civil society, starting with NGOs. Müller writes, “rulers like Vladimir Putin in Russia, Viktor Orbán in Hungary, and PiS in Poland have gone out of their way to try to discredit NGOs as being controlled by outside powers (and declare them ‘foreign agents’).” Sounds familiar? Modi fits Müller’s populist template so precisely that he seems like a bot generated by a populism machine, and not an actual person. It made me wonder: if a near-identical form of populism persists through vast stretches of time and geography, does it then reflect something innate in human nature? I’ll leave you with a pleasant thought, though. Here’s why I think both Modi’s and Trump’s populism will ultimately fail. The narratives of populism, based on some of the people being all of the people, only work in broadly homogenous societies. The USA will be a minority-majority country by the middle of the century (ie, whites will be less than 50% of the population), and a Trump won’t be possible then. As for India, our diversity is our greatest defence against creeping fascism. Populism might work at the state level, but nationally, we are too diverse. That puts a ceiling on how much support Modi can get, which I believe already peaked in 2014, when he could be all things to all people. I think he already senses this. How will he respond?